The accuracy, the politeness, and how fast they can get here. The young man put his slippers on every time he came in, they're definitely a '10'. Everything that we've ever dealt with in regards to them, we've been pleased with. They're courteous, and they give you the information when you ask a question. They're very good, outstanding men. They're very punctual, very thorough, and they have courteous people working for them. I'm just very happy with them. They always follow through with what they say they're going to do. I think they're an honest and fair company. 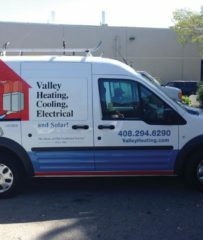 Valley Heating, Cooling and Electrical installs and services all brands of air conditioners, heat pumps, furnaces, fan coils, filtration, thermostats, and fireplace inserts for residential and commercial clients. The company also does duct cleaning and provides residential and light commercial electrical services, including panel upgrades; wiring; and repair and installation of lighting, fans, and switches. In 2009, the company expanded its services to include sales and installation of solar photovoltaic systems for homes and offices. 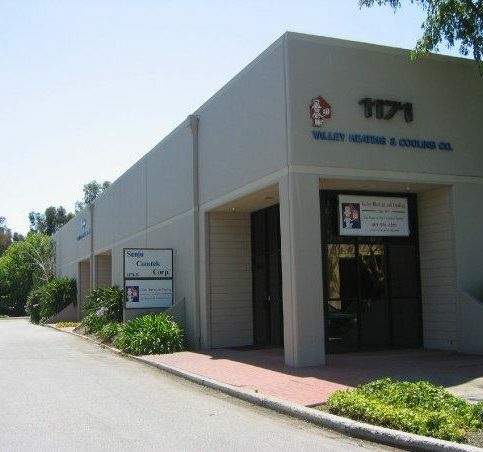 Valley Heating, Cooling and Electrical has been family-owned in San Jose and Silicon Valley since 1962. The company provides a 100 percent satisfaction guarantee and maintains an in-house technical trainer to evaluate and sharpen the troubleshooting skills of its technicians. With this trainer and other testing and certification means, Valley continually verifies its quality standards and has received the American Standard Outstanding Dealer Award and the Lennox Centurion Outstanding Dealer Award. 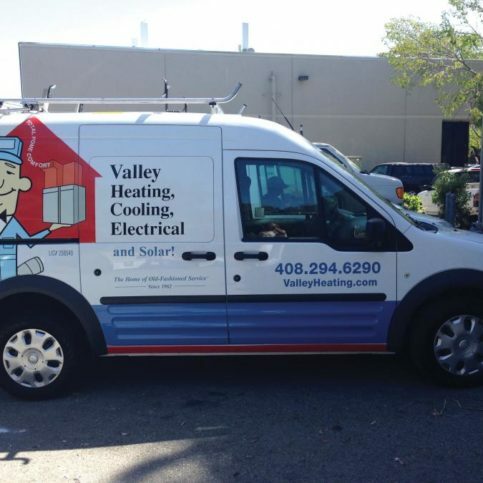 Valley Heating, Cooling and Electrical’s service vans are well-stocked with equipment and parts. Valley Heating, Cooling and Electrical services and installs all brands of air conditioners, heat pumps, furnaces, fan coils, filtration, thermostats, fireplace inserts, blown in attic insulation, and tankless and standard water heaters for residential and commercial clients. The company also handles duct cleaning, dryer vent cleaning, and residential and light commercial electrical services, including panel upgrades; wiring and repair; and installation of lighting, fans and switches. In 2009, the company expanded its services to include sales and installation of solar photovoltaic systems. Make sure you choose the right air filters for your HVAC system. Air filters are a vital part of every heating and cooling system, but many homeowners fail to realize the importance of regularly changing them. Since they’re not often a visible part of the system and slowly lose efficiency with no drastic changes, it can be easy to ignore them. However, there are many reasons to choose the right filters for your system and change them regularly. • Dirty filters are the primary cause of HVAC equipment failure. Once they become clogged with dust, dander and debris, they can seriously restrict air flow and make the system’s fans work harder to blow air. This can cause undue strain on the system and burn out the fan motor. • Clogged filters make HVAC systems work harder to draw in clean air, which wastes energy and increases your monthly bill. • Dirty filters eventually allow dirt particles to enter ducts and vents, which can increase the amount of dust in your home and aggravate allergies and asthma problems. Most air filters last for about 90 days, but that depends on the quality of filter you choose, the efficiency and age of your system, how dirty your air is, and whether or not you have children or pets. If you live in a location with a higher pollen count or more dust, you may need to replace your filters more often. You can replace most filters by yourself—they’re usually located next to your HVAC system’s air handler, which is the large box that houses the fan and motor. Most units have small, hinged covers that allow easy access to the filter. Simply slip out the old filter and replace it with a new one, taking care to not shake or disrupt the dust and debris on the old filter. If your system has multiple or oddly sized filters, consider hiring a professional to help you with the initial replacement. Many HVAC companies also offer annual maintenance plans that include periodic filter changes. Q: How often should I have my HVAC system professionally maintained? A: Furnaces and air conditioning systems should be maintained every year. Ducts and dryer vents should be maintained every two to four years. Q: Do I really need an efficient furnace and air conditioner? A: Efficiency is definitely important when it comes to furnaces and air conditioners. In addition to being better for the environment and costing less to maintain, high-efficiency HVAC systems tend to be a lot quieter than regular systems. Q: How big does my HVAC unit need to be? A: It depends on your living situation and the square footage of your house. We can come out and do a heat load calculation, but most of the time we can provide an accurate estimate based on square footage. Q: How long will it take to install my HVAC system? A: Every job is different, so we’ll let you know how long it will take when we provide the estimate. Q: How soon can you install my new HVAC system? A: We can usually complete an installation within one week of the initial call, depending on what it involves. If you need service or an estimate, we can turn it around the next day. Q: Will you keep my home clean during the installation? A: Absolutely. If the job takes longer than one day, we’ll make sure everything is neat and clean for the next day. We’ll even haul away any removable items on the first day of work. At the end of every job, we do a thorough cleaning and haul away all the old equipment and debris. 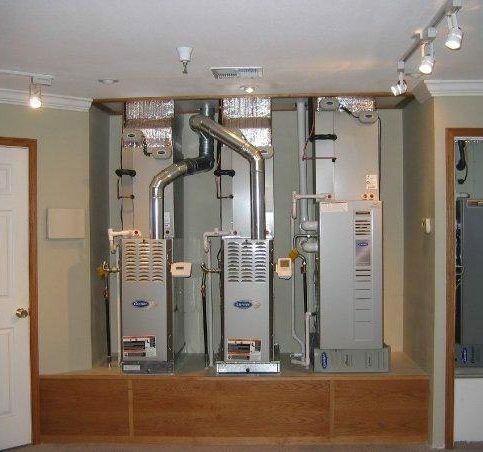 Valley Heating, Cooling and Electrical installs all types of furnaces. Cindy Faulkner is president of Valley Heating, Cooling and Electrical, a Diamond Certified company since 2005. She can be reached at (408) 827-8994 or by email. A: It’s a tie between Rombauer Vineyards in Napa and Savannah-Chanelle Vineyards in Saratoga. A: I was voted “Best Hair” in the yearbook. Q: Who would play your husband? A: Betty White’s character, Rose. 1. Determine which type of thermostat is compatible for your system. For instance, the most common type for a 24-volt system is a universal thermostat. However, this won’t work for baseboard heating, which is a different application. 2. Turn off the power to your heating unit. Typically, there will be a switch located either on your furnace or on the wall next to the furnace. 3. Remove your old thermostat from the wall, and pay attention to the color and configuration of the wires (i.e., R to red and W to white). 4. Attach the new thermostat to the wall and reconnect the wires in the correct configuration. 5. Put the cover on the thermostat and restore power to the furnace. 6. Test the furnace to make sure it operates properly. If you have air conditioning, you should test that as well. 7. Once you’ve determined that everything is working properly, you can program your new thermostat. Throughout the process, it’s important to reference the manufacturer’s instructions to ensure both safety and correct installation. SAN JOSE — Host, Sarah Rutan: In caring for your home’s HVAC system, its important to know how to install a new thermostat. Today, we’re in San Jose with Diamond Certified Expert Cindy Faulkner of Valley Heating, Cooling and Electrical to learn more. Diamond Certified Expert Contributor, Cindy Faulkner: If your thermostat is broken or you’re ready to upgrade, it’s fairly simple to replace it yourself. The first step would be to determine what thermostat is compatible for your system. The most common for a 24-volt system would be a universal thermostat. This will not work for baseboard heating; that’s a different application. The second step would be to read the manufacturer’s instructions completely. Make sure that you’re very clear on that. Turn off the power to your heating unit next. There is a switch that’s either located on your furnace or on the wall next to the furnace that you can just flip off. Next, you’re going to remove your old thermostat from the wall and you’re going to make a map of where the wires go. So, it’s going to be R to red and W to white. Make sure you make that clear because it’s going to be the same when you put the next one back on. Completely remove it from the wall and then mount the new thermostat to the wall using your manufacturer’s instructions. Now you’re going to connect the wires back to your thermostat as per the map that you made and the color designation. Once you’re done with that, you’re going to put the cover of the thermostat on and you’re going to restore power to the furnace by flipping that switch back on. Now to the last couple of steps, which are easy. You’re going to want to test your furnace and make sure it operates properly, and if you have air-conditioning, you’re going to want to test that, too. Once you’ve determined that everything is working great, then you are pretty much done other than programing your thermostat. You can refer to the manufacturer’s instructions and set that up exactly how you prefer when it comes on, when it goes off, and so on. Michael Ziegler is general manager of Valley Heating, Cooling and Electrical, a Diamond Certified company since 2005. He can be reached at (408) 827-8994 or by email. SAN JOSE — People get involved in the HVAC industry for a variety of reasons, from growing up in the family business to simply enjoying the work. For Michael Ziegler, his HVAC career started with a fascination for the scientific aspects of the trade. “I took a refrigeration class as a high school elective and it really piqued my interest in the HVAC field,” he explains. “I really enjoyed working with my hands and was amazed by how refrigeration worked, so I decided I wanted to pursue it as a career.” Later, after returning from a tour with the Navy, Michael furthered his industry education at trade school. After completing a year of training, he began working for an HVAC company in the East Bay. Q: If you could have the power of flight or the power of invisibility, which would you choose? A: Cook some food and watch a good movie. A: Yes, I was a linebacker on the football team, and I also played soccer. A: In my younger days, I once reached about 140 miles per hour while racing in my Mustang. SAN JOSE — If your air conditioning system doesn’t seem to be functioning properly, your first inclination may be to call a professional. However, in many instances, you may be able to identify and fix the issue yourself, which will save you the cost of an unnecessary service call. When an air conditioner doesn’t seem to be operating at full strength or effectively cooling your home, you might assume it needs to be repaired. However, it’s possible that you’ve simply forgotten to set the thermostat to the “cool” setting or to a low enough temperature. Another factor that may affect the performance of your air conditioning unit is dirty or clogged components such as the filter or evaporator coil. Before calling a professional, clean these components and see if it makes a noticeable improvement. Other times, an air conditioning unit may appear to not be working at all. In this instance, first make sure the unit is connected to power. Next, check your electrical circuit or fuse box to make sure the problem isn’t being caused by a tripped breaker or blown fuse. If there aren’t any power issues, it may be something more serious like a blown motor or compressor, in which case you’ll need professional assistance. SAN JOSE — Host, Sarah Rutan: Before calling a professional, there are a few things that you can do to help diagnose your air conditioning system. Today, we’re in San Jose with Diamond Certified Expert Contributor Michael Ziegler of Valley Heating, Cooling and Electrical to learn more. Diamond Certified Expert Contributor, Michael Ziegler: There’s three things you can check if you discover your AC is not working for you. One is to make sure your thermostat is set in the cool position and your set temperature is below your indoor temperature. The second thing to check is to locate your breaker and make sure it’s in an on position. The last thing you want to check is your fuses. They’re located in a disconnect switch box near your air-conditioner. You can pull these out, take them to a local hardware store, and they’ll check them for you. You can always purchase them there also. So, check your thermostat, make sure it’s set to cool, temperature is set below the indoor temperature. Make sure your breaker is in the on position. Check your fuses. And also check your filter and make sure you get yearly maintenance on your HVAC system. Valley Heating, Cooling and Electrical : Average 9.2 out of 10 based on 330 unique customer surveys of customer satisfaction. They do what they say they're going to do, and they're not a hard sell. They're a bit pricier than others, but you have a choice not to purchase what they're selling you. You can go somewhere else as a choice for some cheaper parts or new unit. I had to replace our heater. It's easy to get an appointment when you need it. They are here when they say they're going to be here, and they don't take any unnecessary time. It's convenient. They do a great job, and they do everything that needs to be done. Their employee seems to know what he's doing, he cleans up after himself, and he is very polite. They came and serviced my air conditioner, and it went well. Everything is working. They're efficient, very friendly, and nice to work with. They were very reasonable in price, the quality of their work was great, and they were very timely. I just wouldn't use them again because we moved. The guys who came are all very nice, and looked very professional, and they did a good job. They have always been reliable and courteous. They have really great service. They're friendly, personable, and have great advice. They are very knowledgeable and thorough. I would say the person who came was helpful and very friendly. They're reliable, honest, and reasonable. Their professionalism, the person was very professional in what he did, and how he took care of it. The service was fair, reasonable, and efficient. We've used them a couple of times, and they were really good. We've been pretty happy with them. The quality of their work, and they were fast. They were a well established company. They were very prompt and very efficient. They were prompt, efficient, and very courteous. They communicate very well what needs to be done, what they will do, and how much it will cost.